After putting our tour itinerary together to fish the five rivers which border Namibia – some four years went by before we could swing it into action and get the wheels rolling from our home in Bronkhorstspruit. In between the planning and action, we traded our 1993 Pzazz 7500 triple-axle caravan (it is too long to be an off-roader) for a 2014 Sahara rough roader caravan. It would be a good test for the Sahara as we planned some gravel travel into the itinerary. The rig was headed by a 2013 Mazda BT 50 3.2 auto double cab with standard 17” rims. Over time an Alu-Cab canopy and drawer system was added, along with additional 60 litre fuel and water tanks. The Sahara also has 17” rims amongst other things, like Electro Brakes, electric steadies and motor movers – and tows with impressive stability. Strapped to the canopy roof rack was our RV-5 Oztent and stretchers, as there would be places we were headed to where the caravan would not probably be able to go, such as Epupa Falls, where we’d have to camp rather than have the comfort of the caravan. 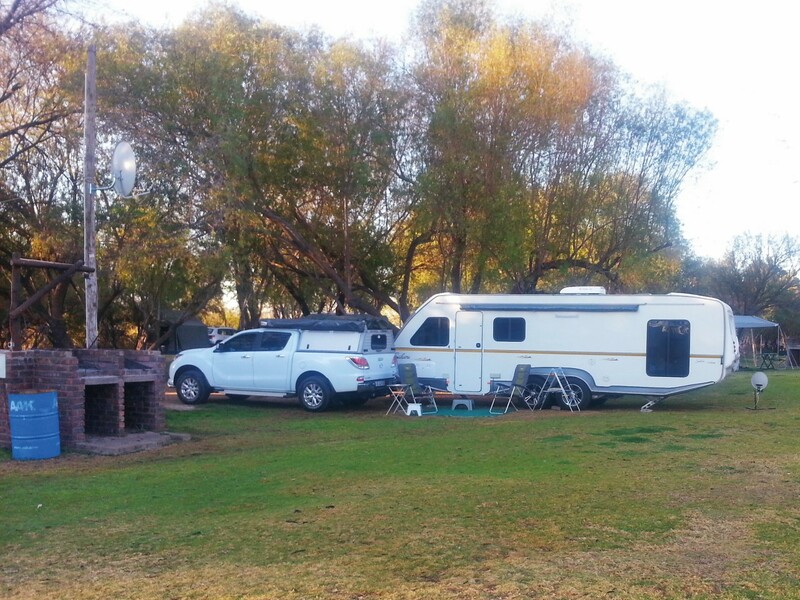 We headed to the Orkney/Klerksdorp area for a few days of camping at Visarend Caravan Park before making our way to Upington. Wanting to go a bit further than Kuruman, we found The Ranch Overnight Chalets, which are about 15 km before the town of Olifantshoek. It’s a lovely place with six private ablution sites. There is a pub and the restaurant serves great food. Having not camped at Oranjerus Resort before, we opted to spend four nights here and do some checks on provisions and mechanicals before heading out again. Those of you who have been there will probably agree that it is a good place to relax and enjoy the river and birdlife. 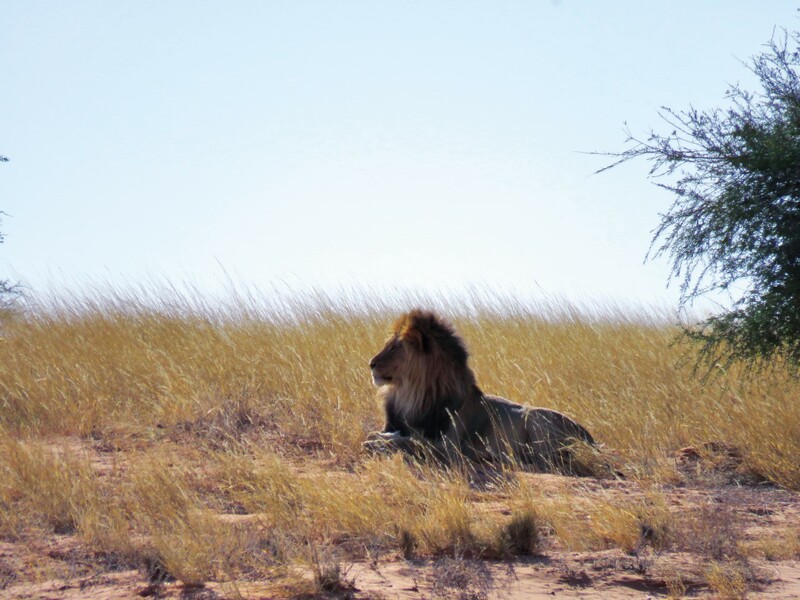 Having made the necessary bookings in the Kgalagadi at Mata Mata (1 night) and Twee Rivieren (3 nights), we first made our way to Molopo Lodge for the night. Here we found that they have 12 campsites and each has its own ablution with key access. It’s a great place to stay over if you wish to get an early start for the park in the morning. We ventured around the park to see what the animals were up to and got to know the area better for a future visit. We saw a variety animals and abundant birdlife. Before journeying to Mata Mata, the caravan tyre pressures were dropped to 1.5 bar. Some thought we were crazy to take a caravan along that road, but then they perhaps mistook our rough road caravan for a conventional caravan. Their concerns did indicate the state of the road, which we appreciated. We arrived safely at Mata Mata, having stopped at one of the picnic sites to check that nothing was loose or broken inside the caravan. Keeping a good medium pace on the road appears to be the answer. Of minor significance were the spice container lids that had worked themselves loose due to the rattling and jarring of the caravan but luckily without any spillages. Travelling to Keetmanshoop offered good gravel travel all the way and we could cruise up to 80 km/h when allowed. Here we camped at Maritz Country Lodge camping area. Not much has changed by way of the camping area since 2004, but it’s fine for a quick overnight stop. 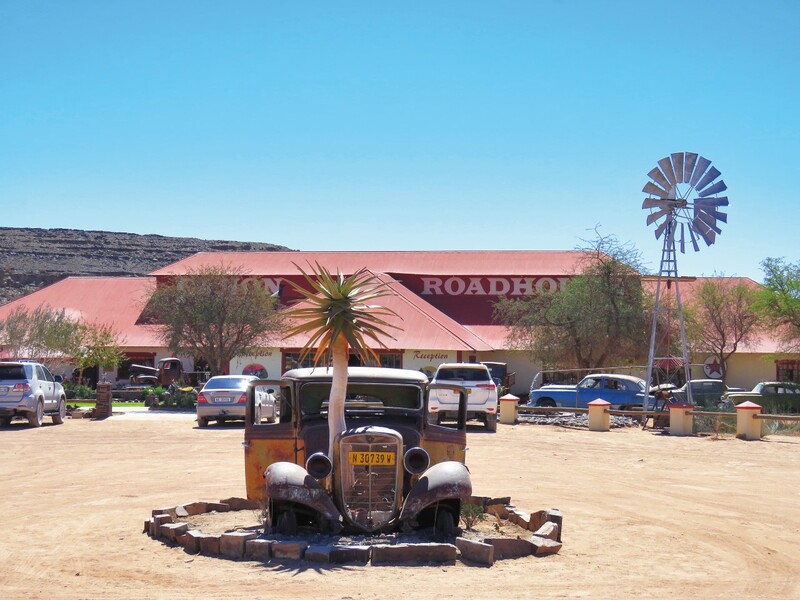 The plan from Keetmanshoop was to find our way via Grunau to Canyon Roadhouse (CRH), but before hitting the road, we went to MTC in Keetmans to purchase Namibia talk and data SIM cards, as we planned to be in the country for about 60 days. I phoned ahead to CRH to book a camp site for us… I couldn’t believe it when told me that they are full for that night, but from the next night we could get 3 nights, which we accepted gladly. Subsequently we learned that this was the time (August, September and even into October) that many Europeans visit Namibia and travelled around the country in hired vehicles and overlanders, having pre-booked from abroad. Our thinking was that because the SA and Nam schools were in session, we could just pitch up at places and get any type of accommodation we wanted. But from then on it worked out safer to call ahead. 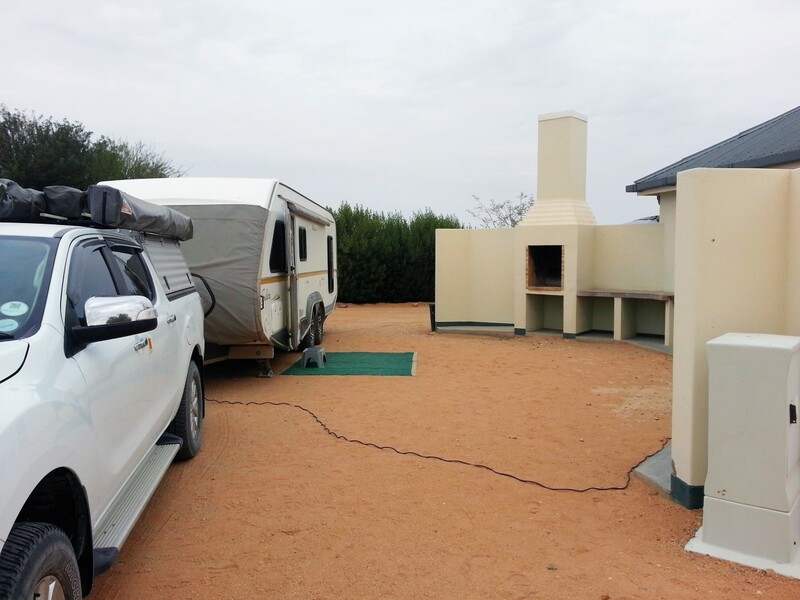 We decided to go for Grunau and overnight at the lovely Grunau Chalets campsite (4 sites in a block, each with own ablution, braai, power point). However, before we could hit the road again my wife pointed out to me that the caravan’s left back tyre was looking pretty flat. The culprit we detected was a stick that hitched a ride from Mata’s campsite, fortunately lodging itself nearer the tread than the side-wall, so out came the tyre repair kit and the puncture was quickly repaired. That was the only tyre issue we had on the whole journey. After a good night at Grunau, we made our way to Canyon Road House, a 70 km trip on gravel. We thoroughly enjoyed CRH with its car museum, clean ablutions and campsites with power, braais and fresh drinking water. 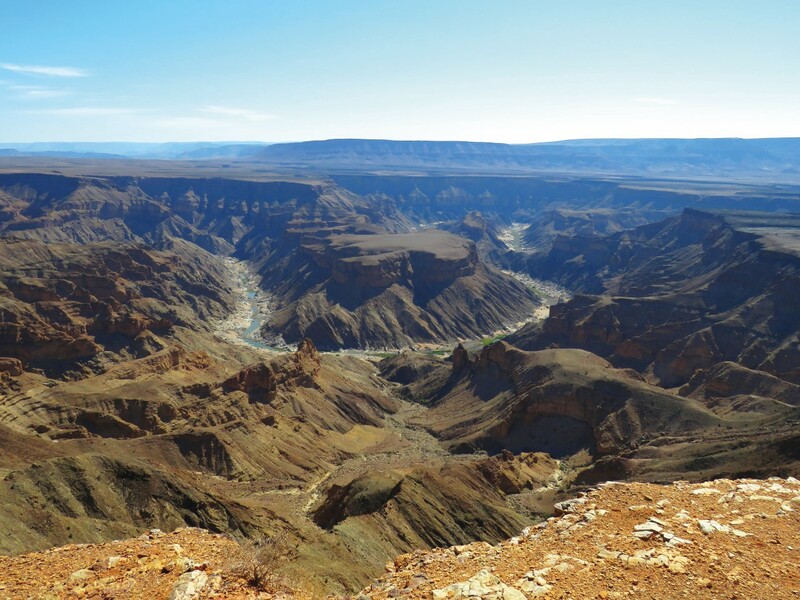 With Canyon Road House as our base, we visited Ai Ais and the Fish River Canyon lookout point. What beautiful scenery there is in that whole area. The canyon lookout point is beautifully constructed, offering scenic views. 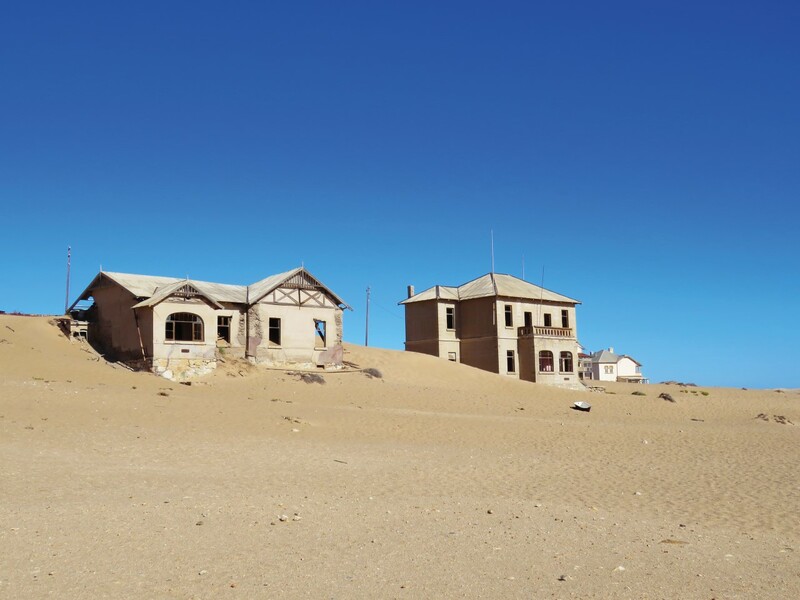 Our plan was to next camp at Klein Aus Vista, leave the caravan there and visit Kolmanskop, Diaz Point and surrounds, with a possibility of overnighting at the Kairos guesthouse in Luderitz. However, after phoning ahead, this plan was not to be as Klein Aus Vista was fully booked for two of the three nights we wanted to be there, so we were forced to go all the way west to Shark Island. 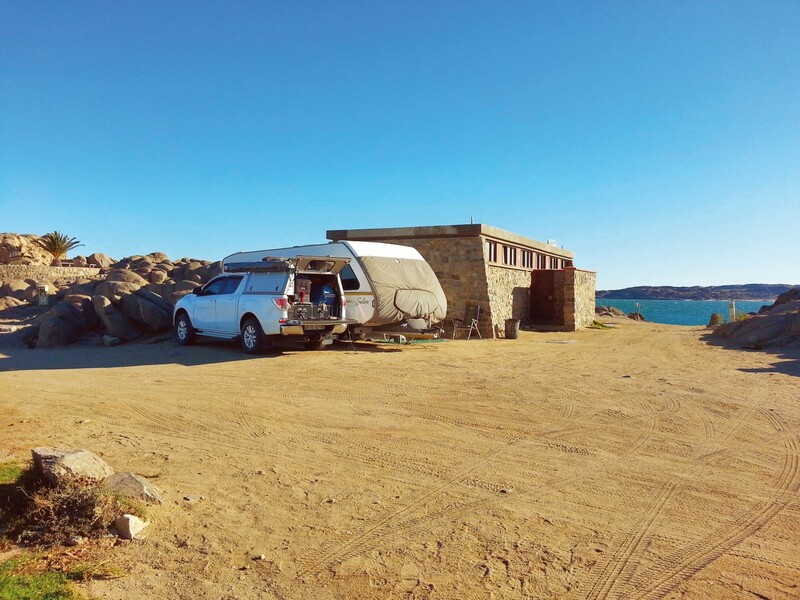 We then stayed one night at the Desert Horse Campsite at Klein Aus Vista on the way back from Luderitz. It’s not difficult to see why so many people enjoy camping there. A visit to the Bahnhof Hotel in Aus is worth the time for a slice of lekker cheesecake and coffee. We also had some good sightings of the desert horses. The wind blew from late afternoon and during the night, cooling the area down. In the morning it was freezing and the bakkie had ice on the windscreen. 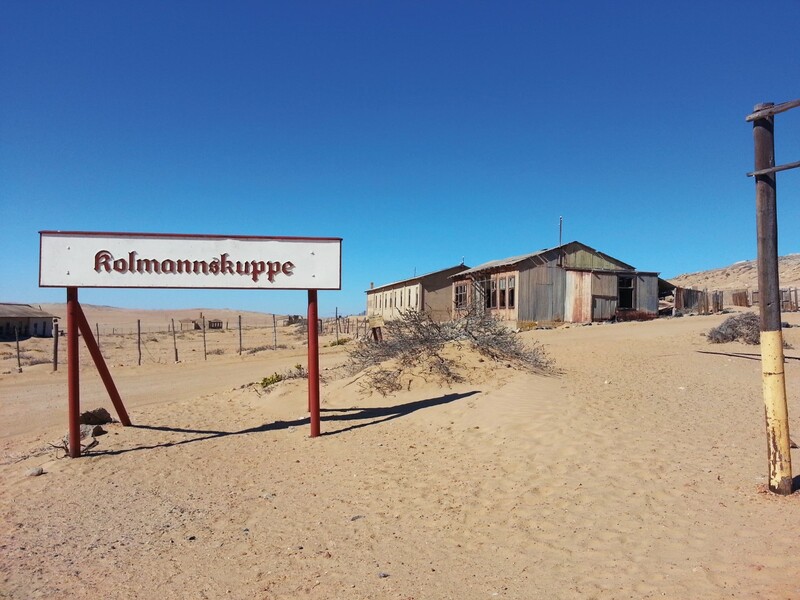 From Aus we headed inland and north via Keetmans to Mariental. 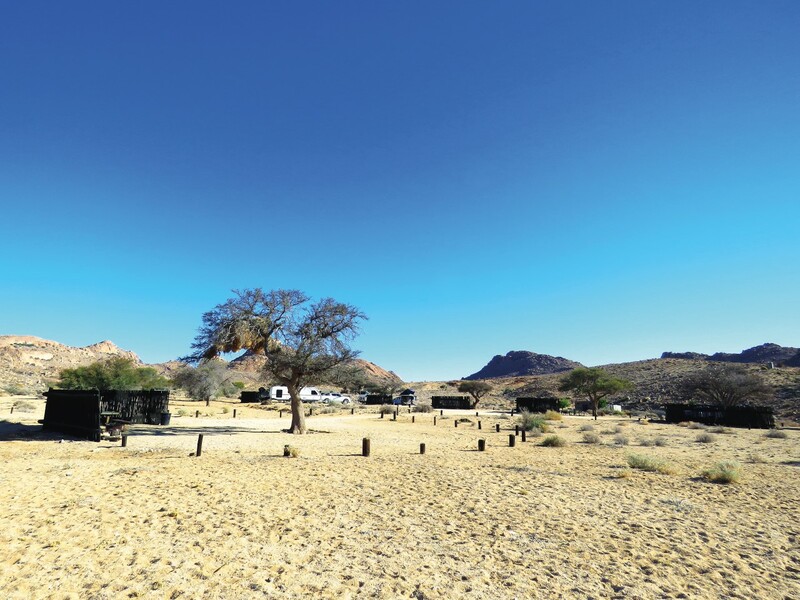 We had learned about the Bastion Farmyard B&B, which is about 15 kms North of Mariental and decided to book in there and use this as a base from which to visit Sossusvlei. At Bastion there are only four stands, each with own private ablution. It is an excellent place to camp with all that is required. There are chalets and a restaurant and a lovely little shop. Try and steer your wife clear of the shop! We left the caravan at Bastion for a few days and headed for Solitaire via Maltahohe, this time geared up for tenting. It was good to stop at the Pappot in Maltahohe and speak to Henriette, who has a wealth of knowledge and insight available for travellers. The C14 gravel road was good and well maintained to Solitaire and the countryside picturesque and beautiful. This was our first visit to Solitaire and of course we needed to tackle the famous, much spoken and written about apple pie/crumble (Apfelstrudel) of the late Moose McGregor. What a pleasure! Here you will also find bus-loads of eager overseas visitors pouring in and out of the area. With our taste buds suitably satisfied (and some spare strudel in the fridge), we headed off to Sesriem. 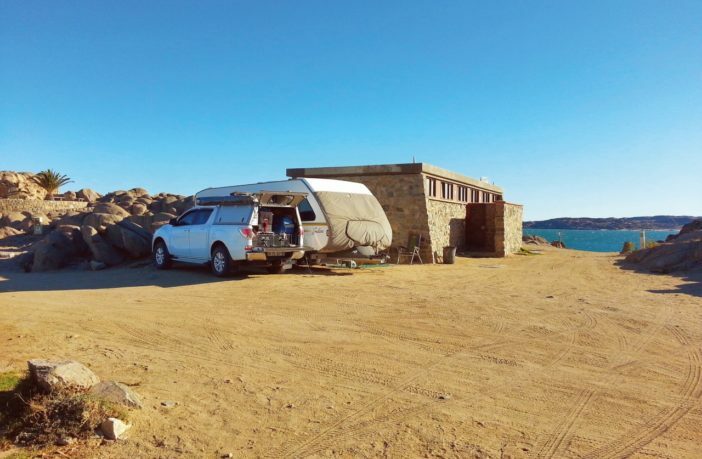 Attempts in the preceding week to book places at either the Sesriem campsite or the Sossus Oasis proved fruitless, but fortunately Little Sossus Campsite had space for two nights, which is neat with 12 sites each with their own high-roofed private site. Here one can, if you have a roof-top tent, reverse your vehicle in and set things up. Setting up our Oztent in the wind-protected building was easy, even while there was a relatively strong wind blowing. Early the next day, we headed the 40 km to the Sesriem gate for our day out at Sossusvlei. As with our previous visit here in 2004, the wind had died down and the day even presented us with drizzle and rain from overcast to sunny skies. Dune 45 was packed with overseas visitors and tour busses, so we headed for the vlei. Once there, we tackled the 5 km 4×4 track to the parking area and walked 1.1 km to Dooievlei, something we missed doing in 2004. 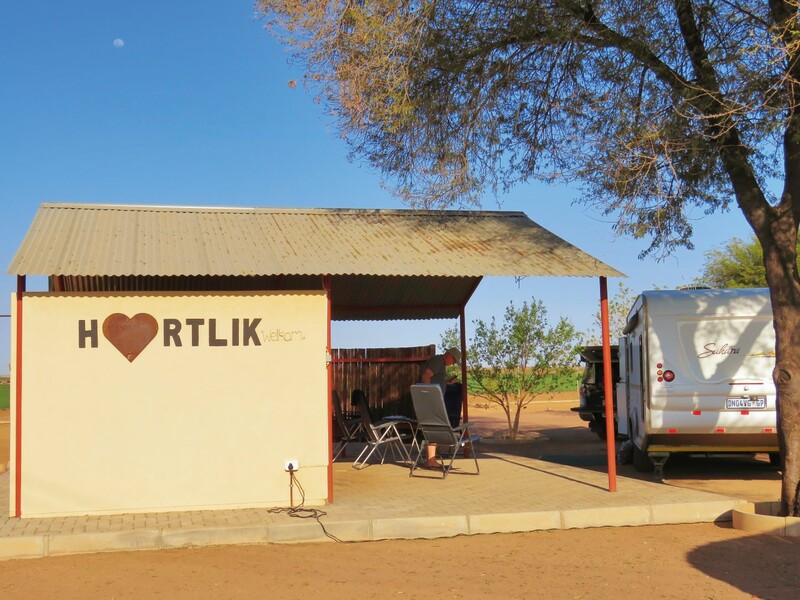 From Little Sossus Campsite (now day #29), we took the scenic Zaris Hoogte route via Maltahohe back to Mariental and Bastion Farmyard to be reunited with our caravan. But not without first having some coffee at the Woestyn Kombuis in Maltahohe. Lekker! We paid a visit to Hardap Dam to check on the renovation progress because we had heard that the facilities had not been maintained for some years and were now being renovated. You can have a good meal at the restaurant with a pleasant view of the dam. The chalets were renovated first, and next were the camping areas (ablutions received a facelift, new power points installed). It was good to see this. 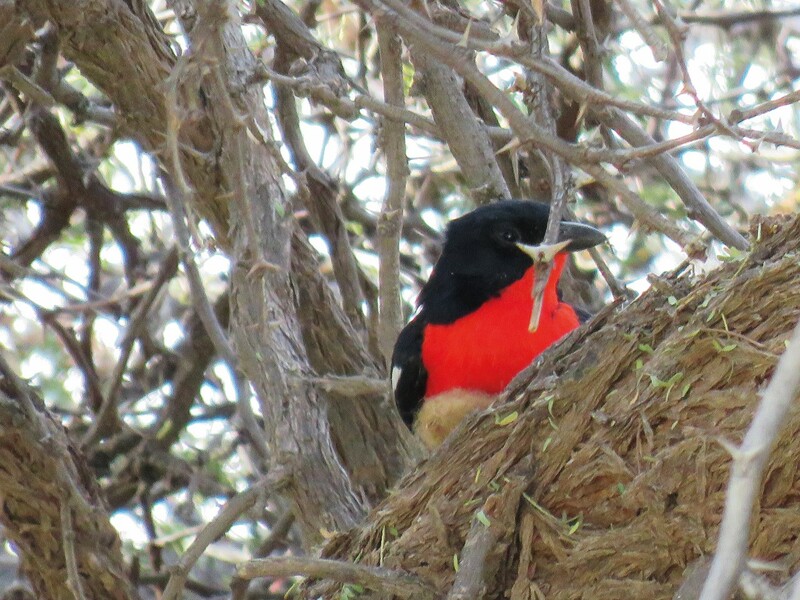 After a month in Namibia, we headed for Windhoek. Our booking for the next three nights was at Daan Viljoen National Park. We booked into the Porcupine Campsite which features seven luxury campsites with private camping facilities that accommodate up to six people. 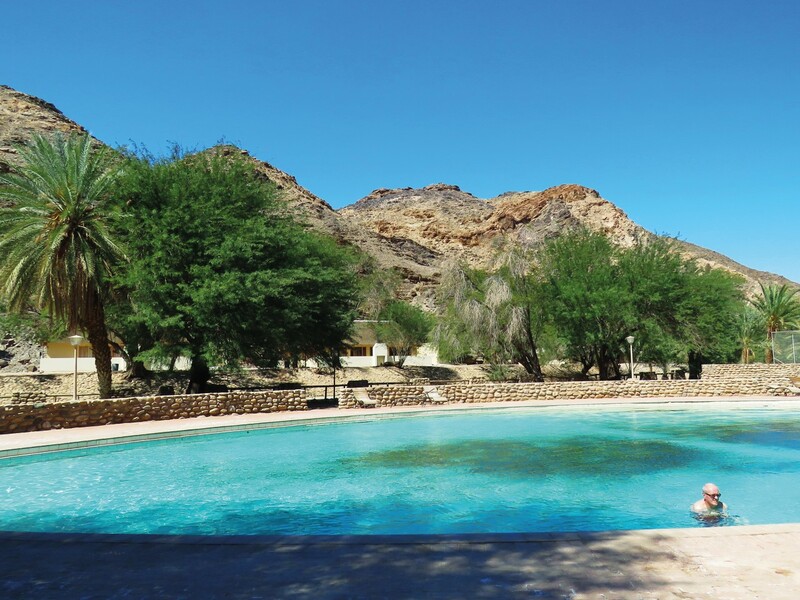 These campsites are beautiful and really well looked after. 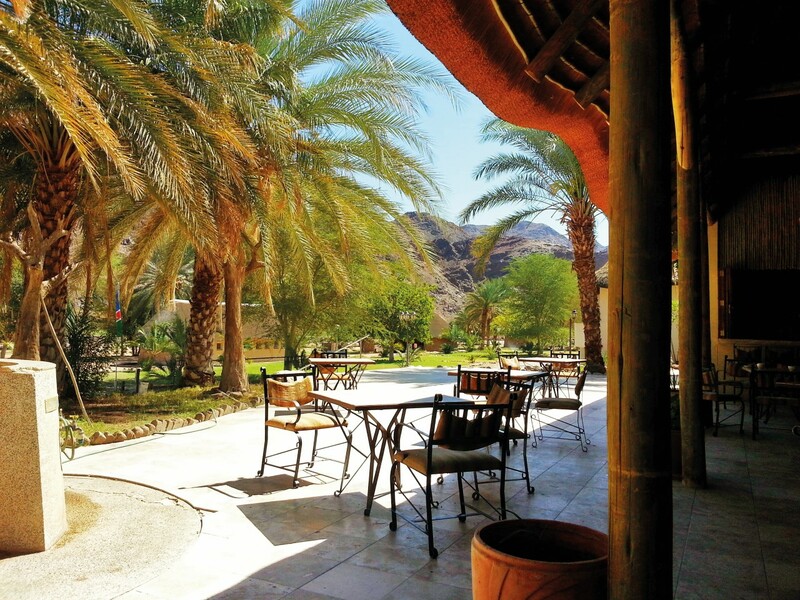 The non-private sites are about 12 in number and also well maintained with excellent ablution facilities. From Daan Viljoen we headed off to Erindi Private Game Reserve, a first for us. Their campsites each have their own ablution and shade net covered the site. The ablution has solar panel heating for the hot water system and a very large-sized fridge to help you cope with the heat out there. We did feel the cost for two people was a bit excessive and if we had utilised the six people per site allowance, it would have made it a lot easier on the pocket. If you wished to self-drive the park area, you would have to pay upward of R200 a vehicle to do so. 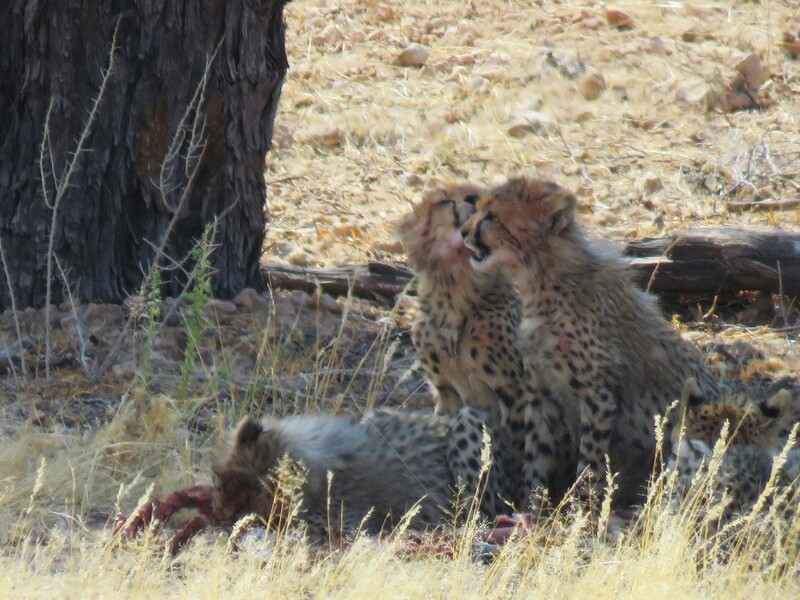 We decided to take two of the Erindi game drives and saw quite a bit of wildlife. The water hole at Camp Elephant is very well situated and one can sit at various spots and observe wildlife coming for a drink. 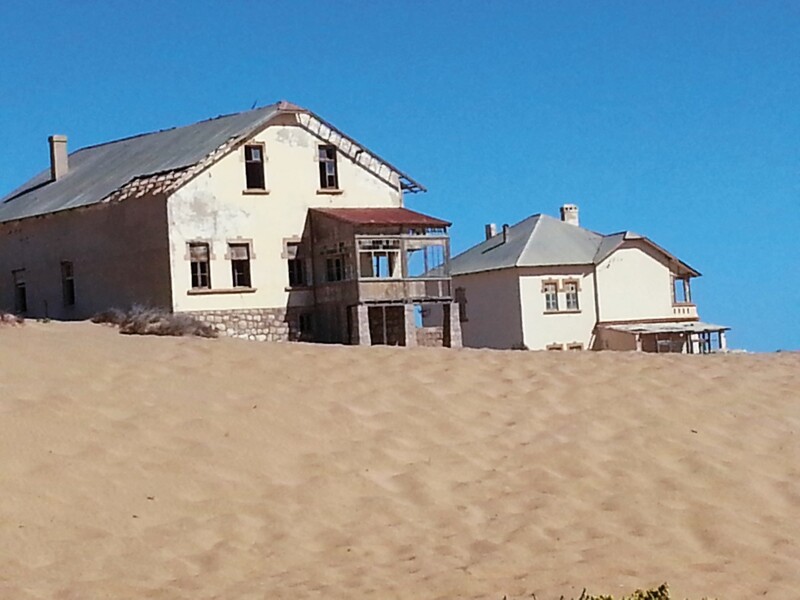 Our next stop for four nights was Swakopmund where we found space at Alte Brucke. This camp has a nice set-up and we enjoyed the area and surrounds, doing the Welwitschia route with the Moon Landscape and going to Goanikontes Oasis. 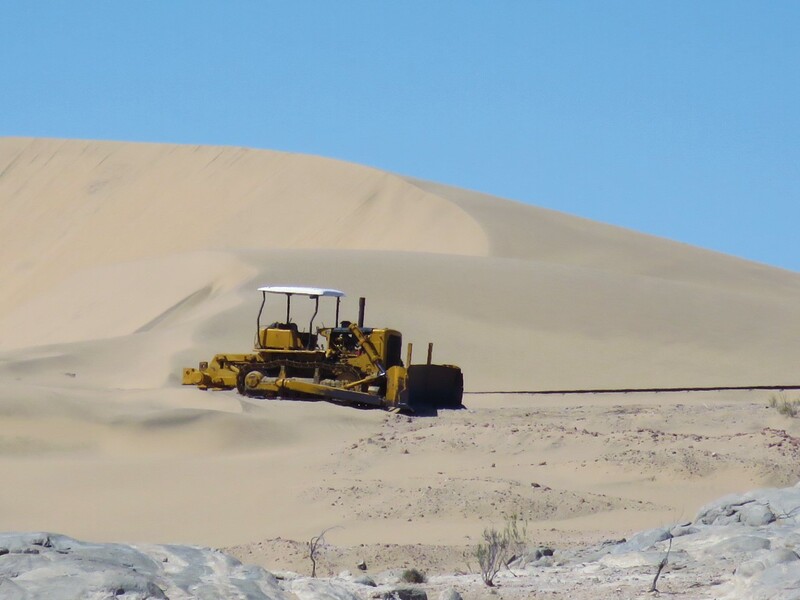 It certainly is a wonderful area, but next time we plan do the Living Desert tour offered by Tommy’s Tours of Swakopmund. 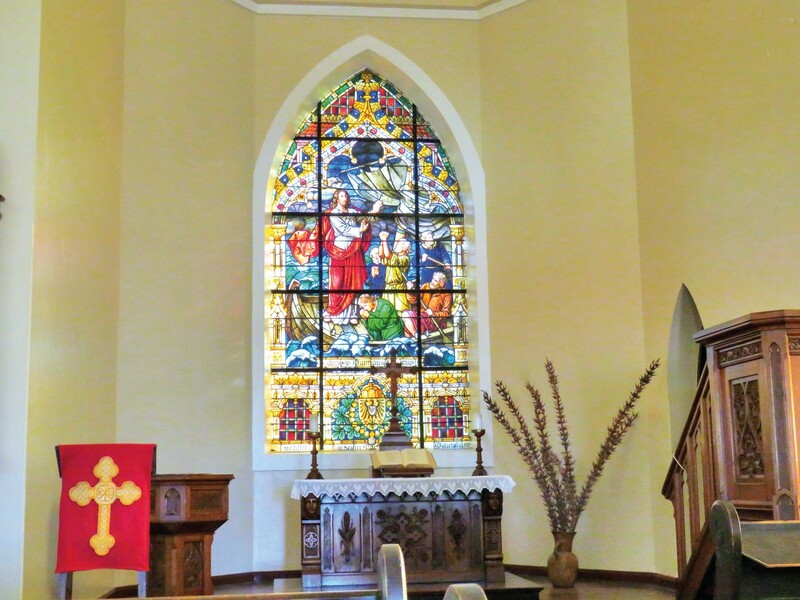 In Part 2 of Bob and Anna-Marie Vaughan’s travels, the couple visit more exciting “bucket list” destinations in Namibia, including the Etosha National Park, Epupa Falls, the Kunene and Kavango Rivers, and into the Caprivi. Make sure you get the February edition of Caravan & Outdoor Life to read about their adventure.